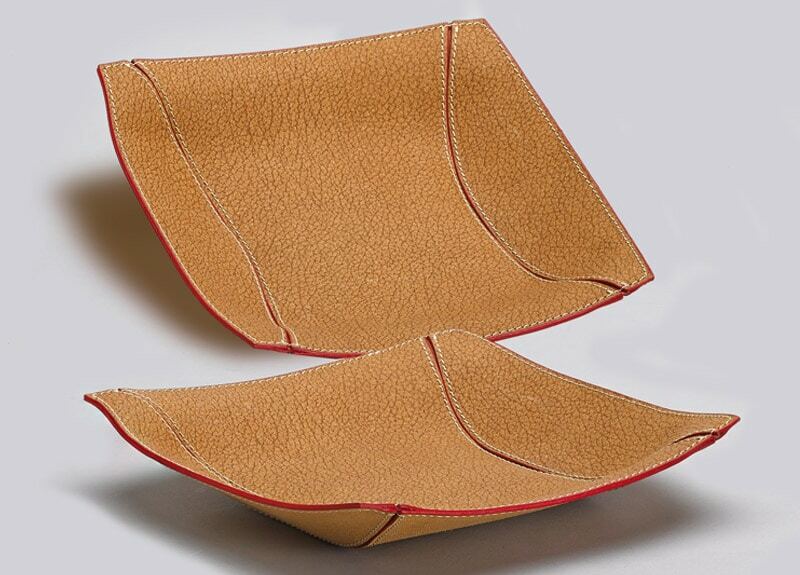 The RICUOIO® (Releather) line uses a material made from scraps of leather shavings, tanned by the addition of natural rubber. It is as soft and elastic to the touch as the original raw material. The items in Alisea’s collection range from briefcases to purses, from folders to notebooks, from pen holders to coin trays; objects designed with technical skill, craftsmanship and elegance. RICUOIO® is available in charcoal gray (from trimmings of dark leather) and brown (from trimmings of light leather). “By choosing an item from Alisea’s RICUOIO® range you are not contributing to the consumption of virgin raw materials, particularly those of animal origin”. “Working with scraps of leather was one of Alisea’s first challenges because, as we live in Vicenza, we are familiar with the world of the tanneries and the amount of inevitable waste that is produced by this process. 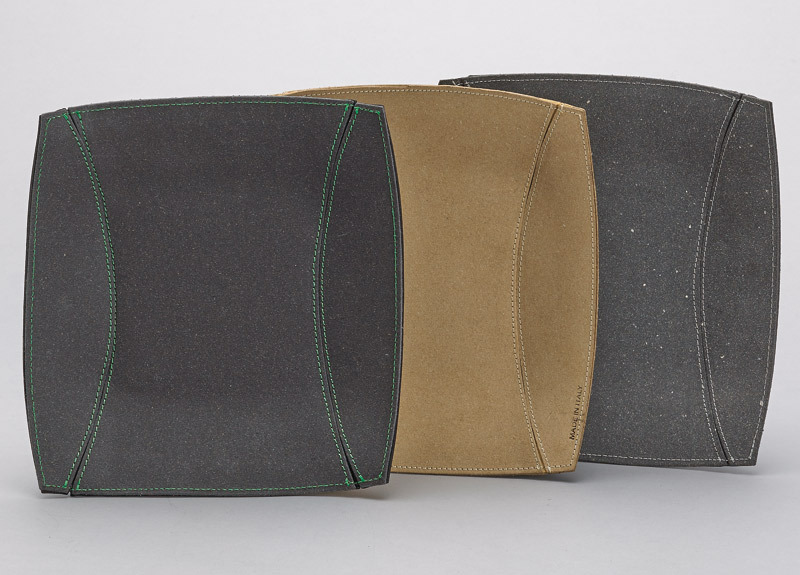 The Ricuoio® cover is available in charcoal gray or Havana brown. 90 sheets of light-colored recycled paper inside. Sizes A4, A5, A6. Customization: silk screen printing, hot stamping with or without color, digital printing. Examples of customizations on gray and Havana brown Ricuoio®. 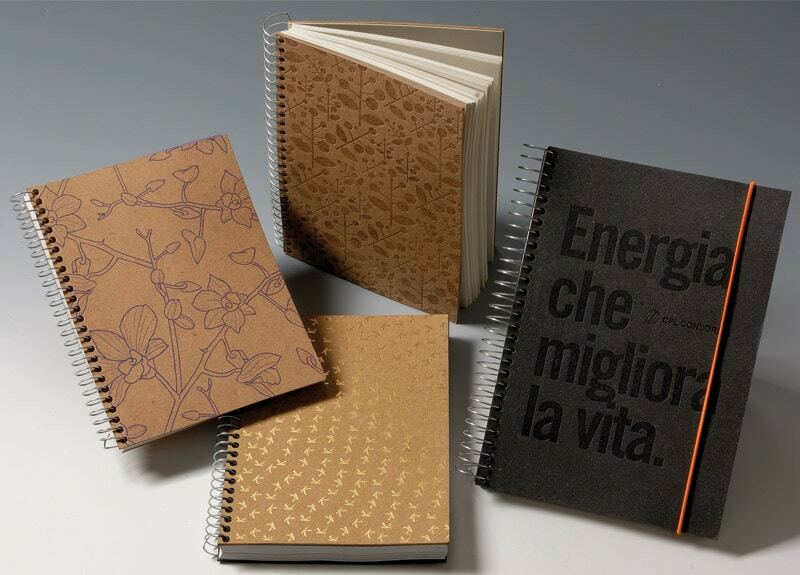 Examples of customizations on gray and Havana brown Ricuoio® using hot stamping and silk screen printing. 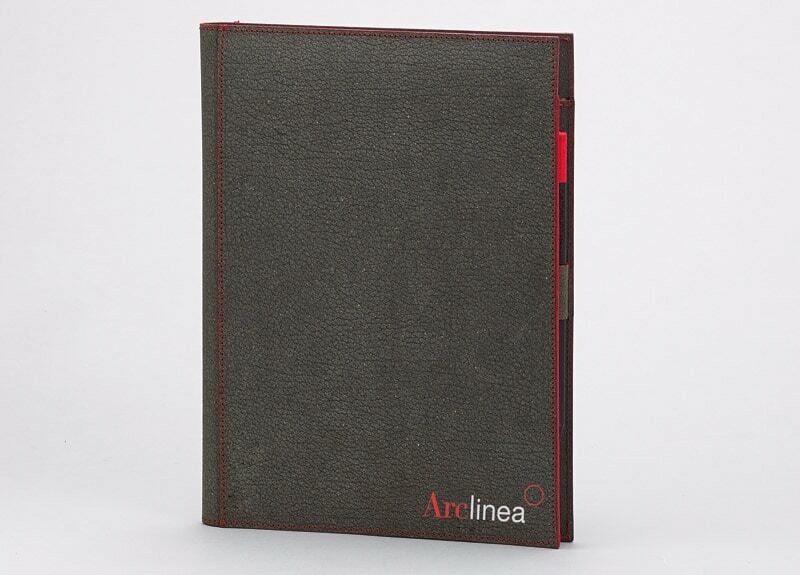 The folder is made of gray Ricuoio® with stitching along the edge using cotton thread in contrasting colors. 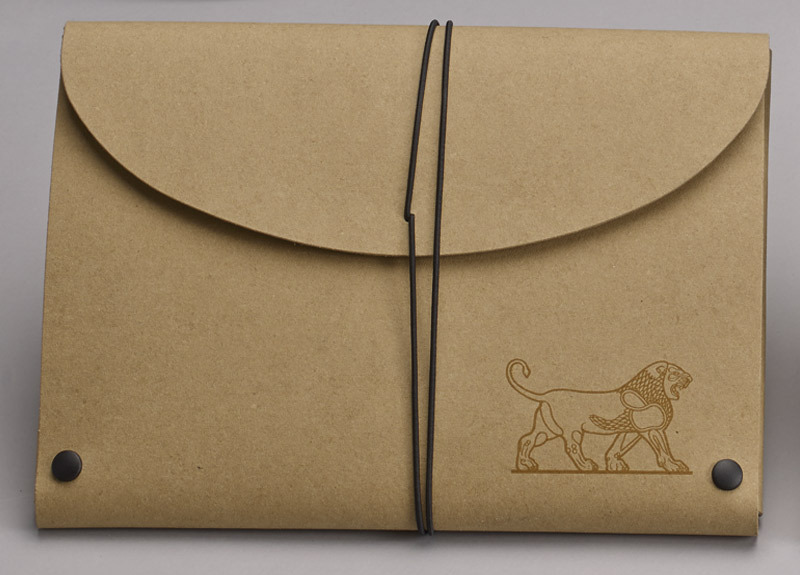 The surface of the folder is embossed with a texture that mimics the “grain” of buffalo hide. The edges are painted by hand with vegetable-based colors. 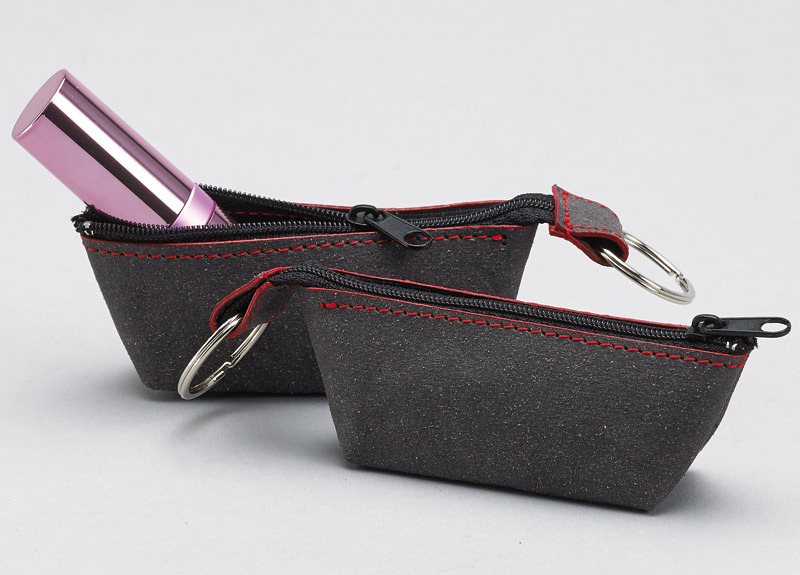 Internal pocket for holding documents, a pocket for a notepad and a pen holder. Detail of inside pockets with red colored border and cotton thread stitching to match. 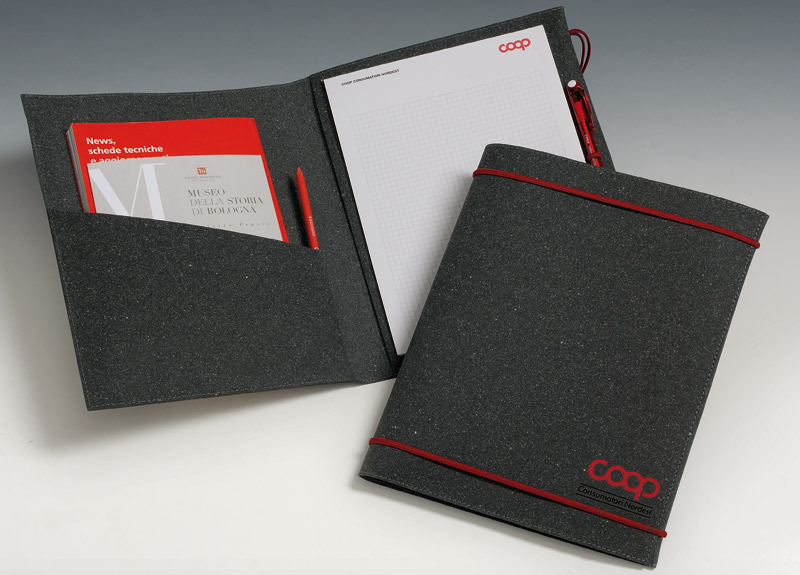 Optional internal notepad of recycled paper, which is also customized. Special pens with a colored border. 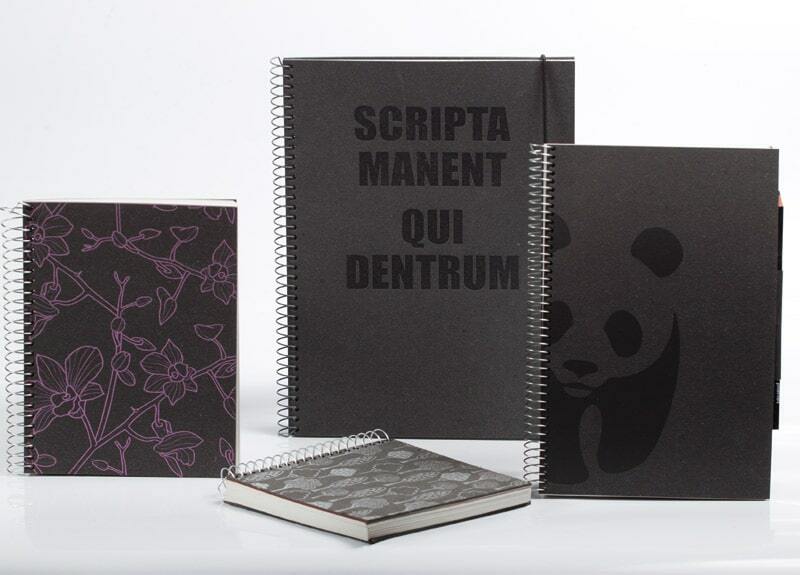 Charcoal gray Ricuoio® agenda cover with silk screen printing over the entire surface. 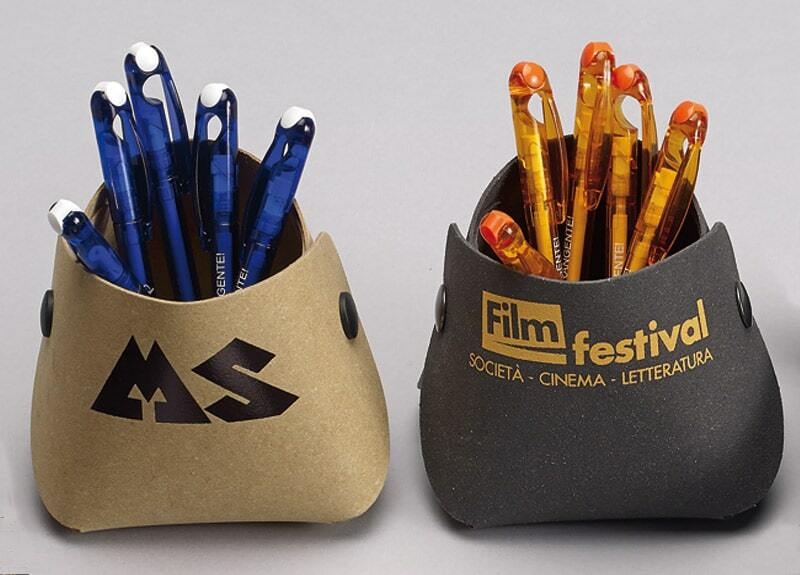 Elastic fastener and pen holder. 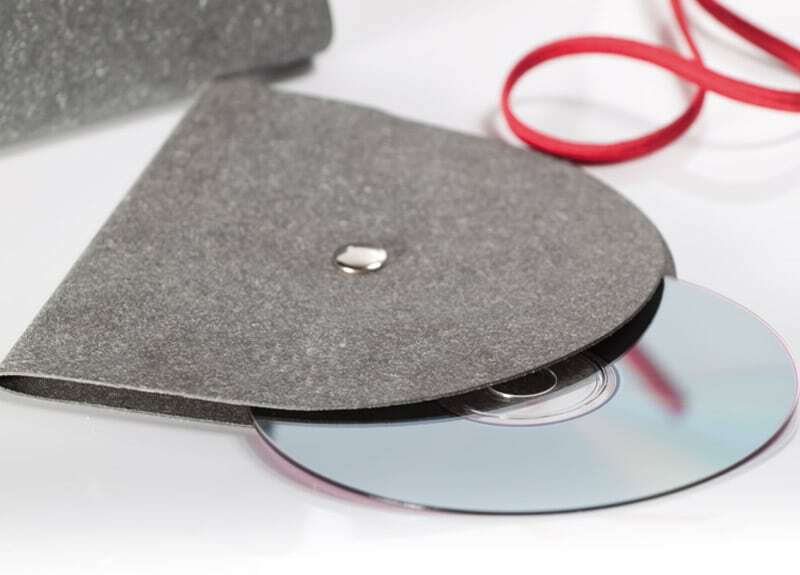 Gray Ricuoio® presentation folder with silver hot stamping over the entire surface. 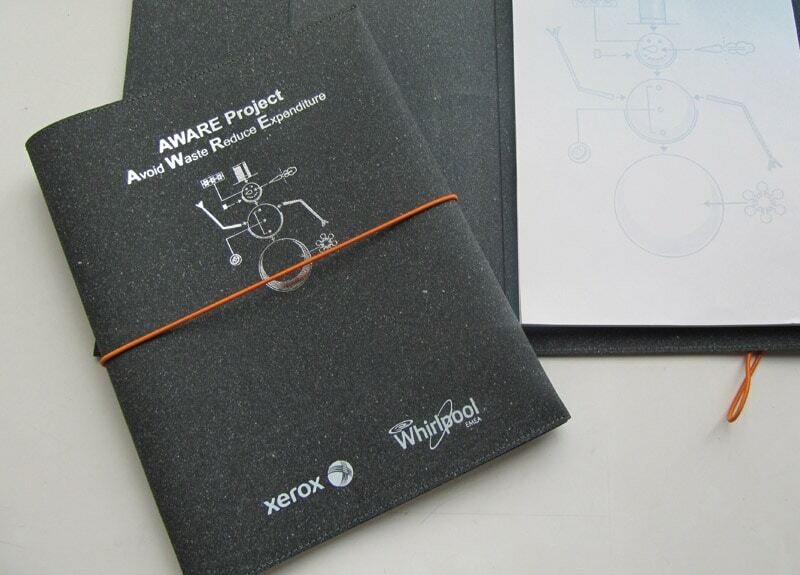 Created for the Whirlpool EMEA – XEROX conference. 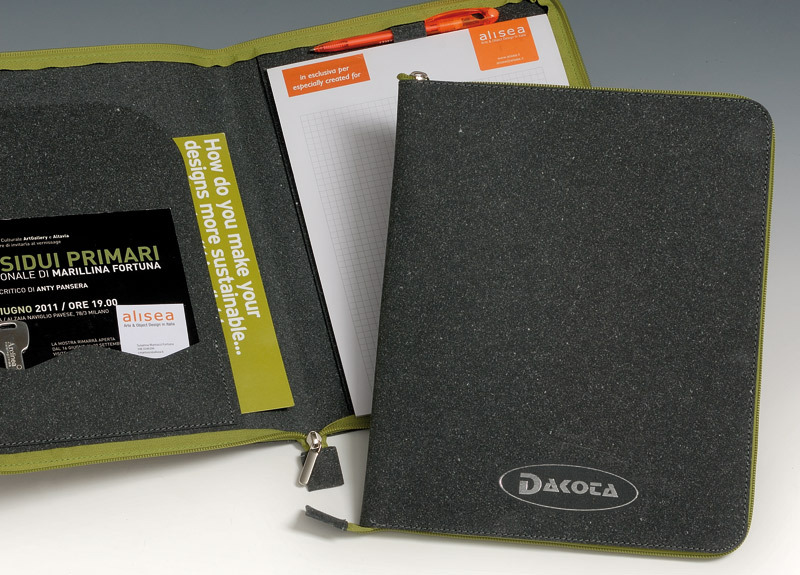 Gray Ricuoio® presentation folder with double elastic fastener, internal elastic pen holder and matching cotton stitching. 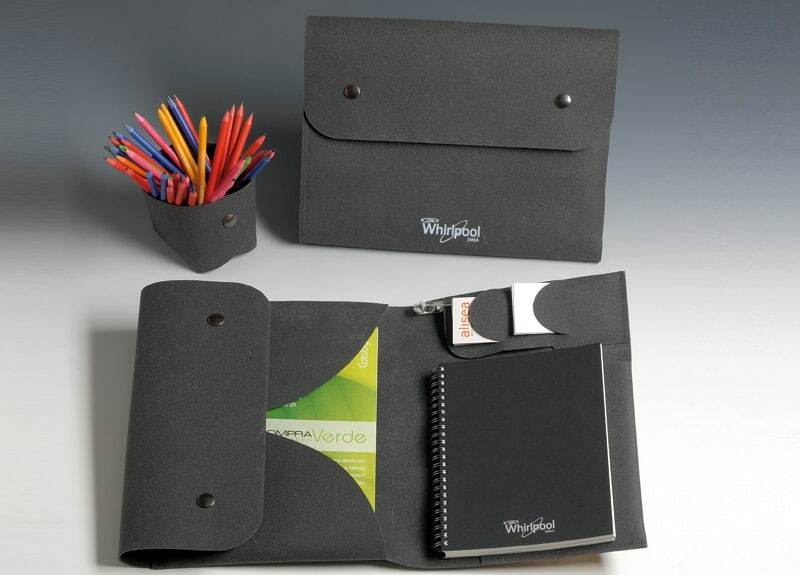 Interior includes: notepad pocket and pocket for catalogs/documents. Elastic fastener colors: orange, black, yellow, light blue, red, green, gray. The Ricuoio® used by Alisea is produced using the leftover leather from the Italian footwear industry that would otherwise have ended up in landfill. 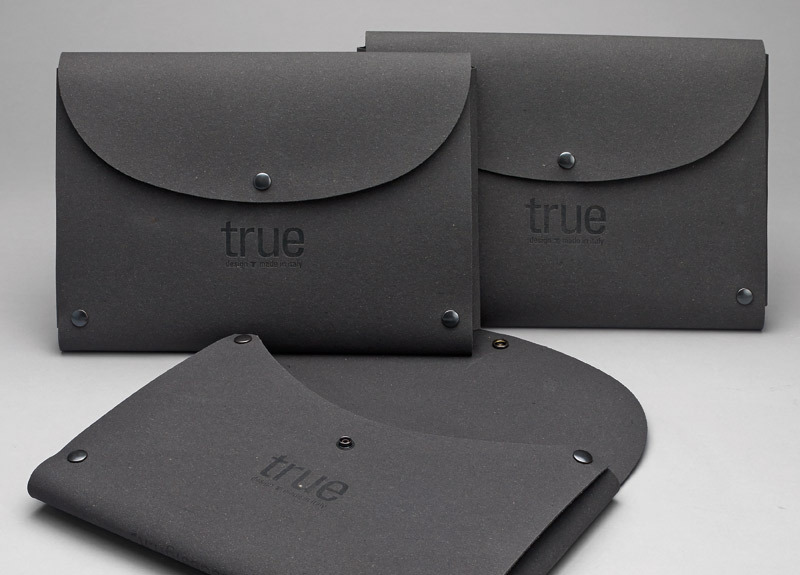 The surface of the folder is molded (embossed) with a texture that mimics the “grain” of buffalo hide. The edges are painted by hand with vegetable-based colors and the outer seams are made of cotton thread. Zipper closure. 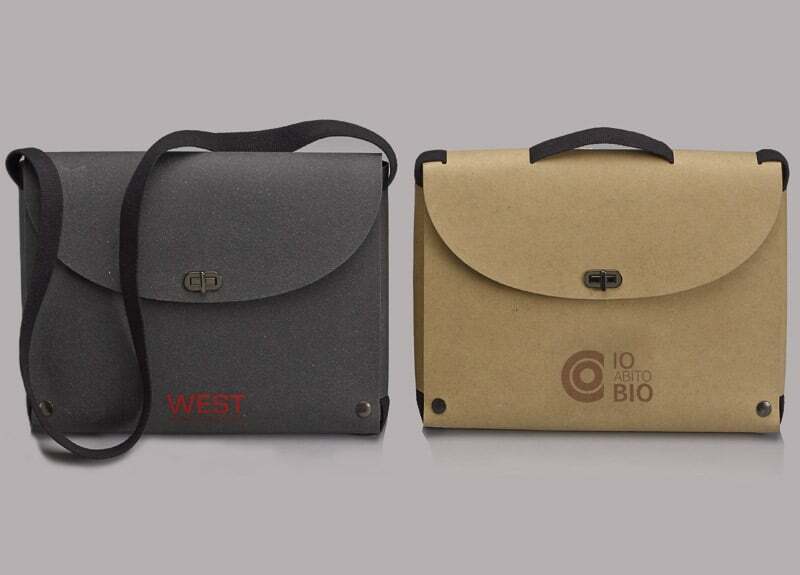 Inside: 2 document pockets, one notepad pocket and pen holder. Detail of the inside of the case. 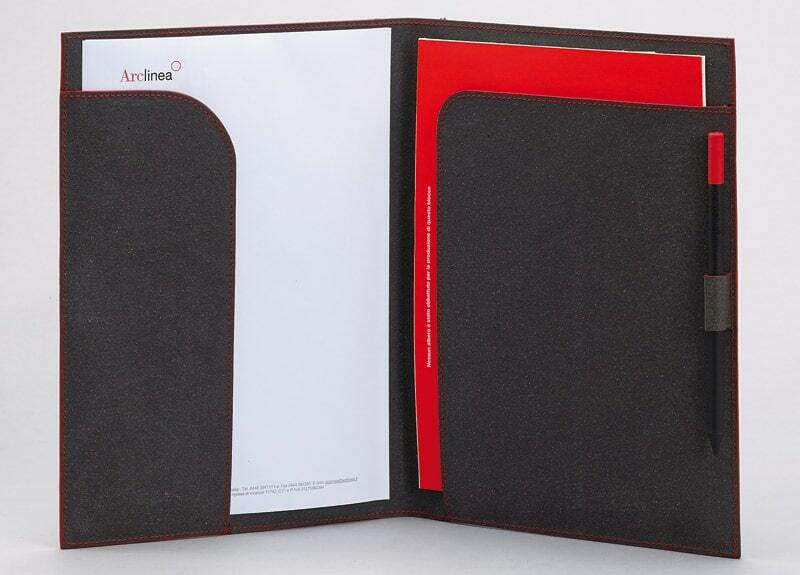 Optional internal notepad of recycled paper, which can also be customized. 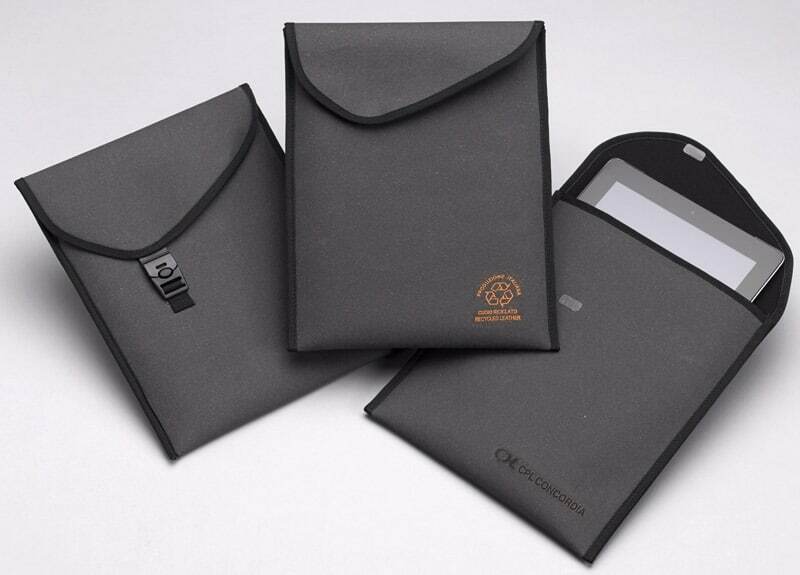 Charcoal gray Ricuoio® folder case with silver hot stamping. 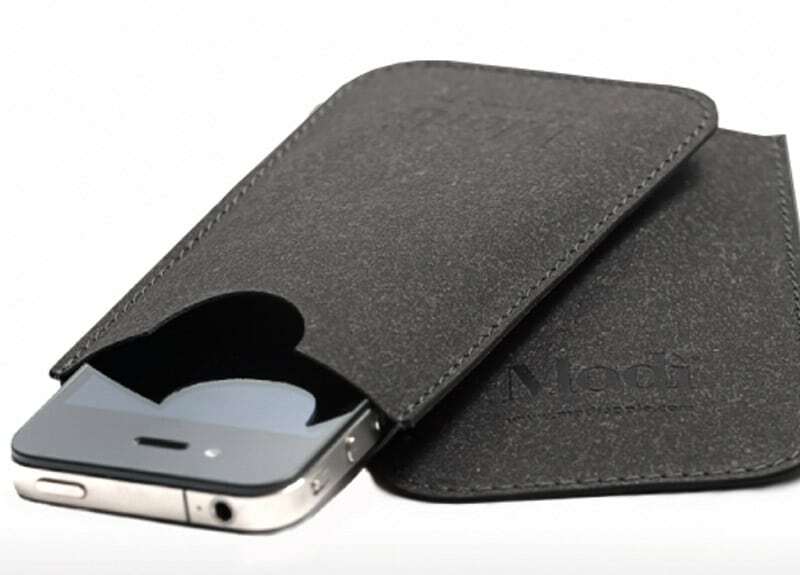 Charcoal gray Ricuoio® case with two-color hot stamping. Zipper colors: orange, green, red, light blue, yellow, white, black, gray. The Ricuoio® multipurpose folder is made from the residues of the leather-working process with the addition of natural rubber. Ricuoio® is available in charcoal gray or Havana brown. 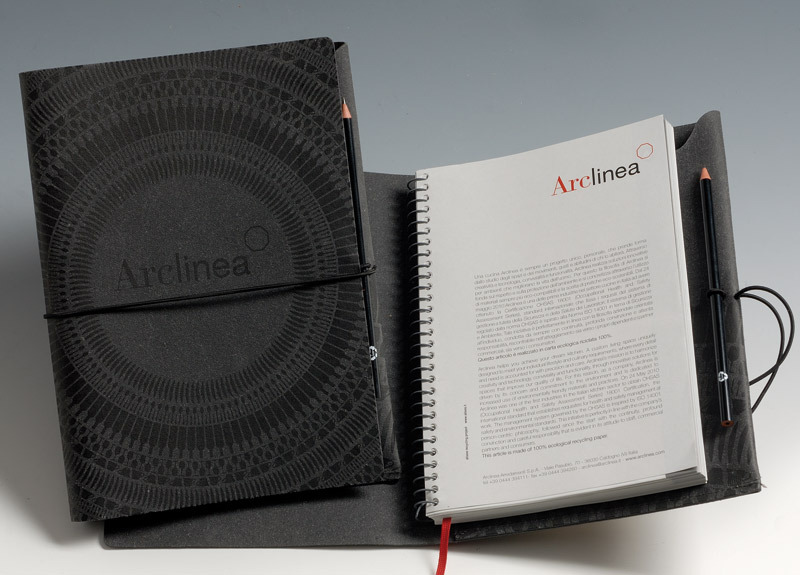 Inside includes: pocket for catalogs/documents, pocket for 15×21 cm (5.91×8.27 in) notebook or notepad, pockets for business cards. Size when closed 25×33 cm (9.84×12.99 in). 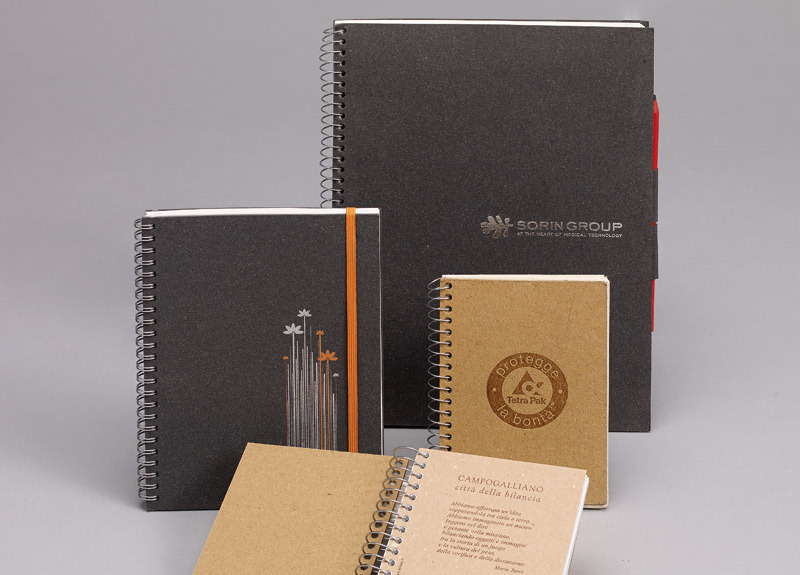 On request, a customized notepad on 100% recycled paper can be added to the multipurpose folder. Gray Ricuoio® folder case, with snap button fastener: SMALL 35x25x2 cm (13.78×9.84×0.79 in). Havana Brown Ricuoio® folder case with double elastic fastener: MEDIUM 37x27x5 cm (14.57×10.63×1.97 in). 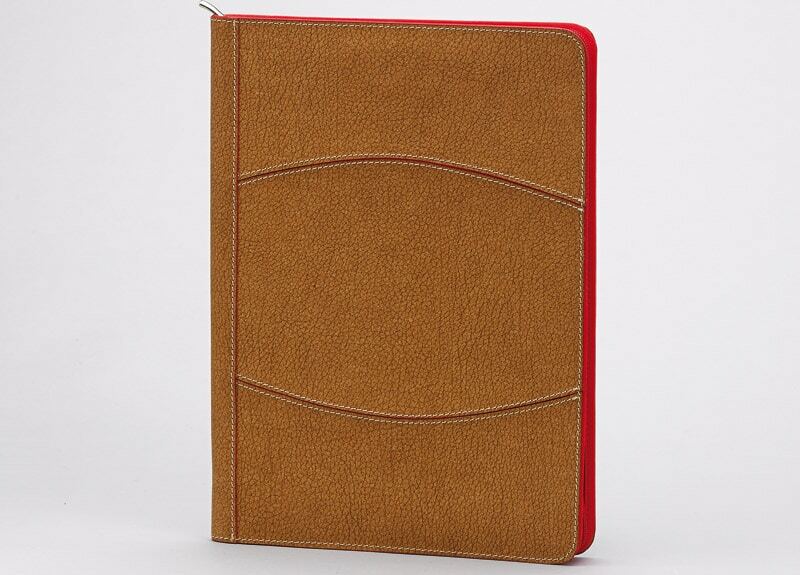 Havana brown Ricuoio® folder with rubber shoulder strap, and colorless hot stamping. 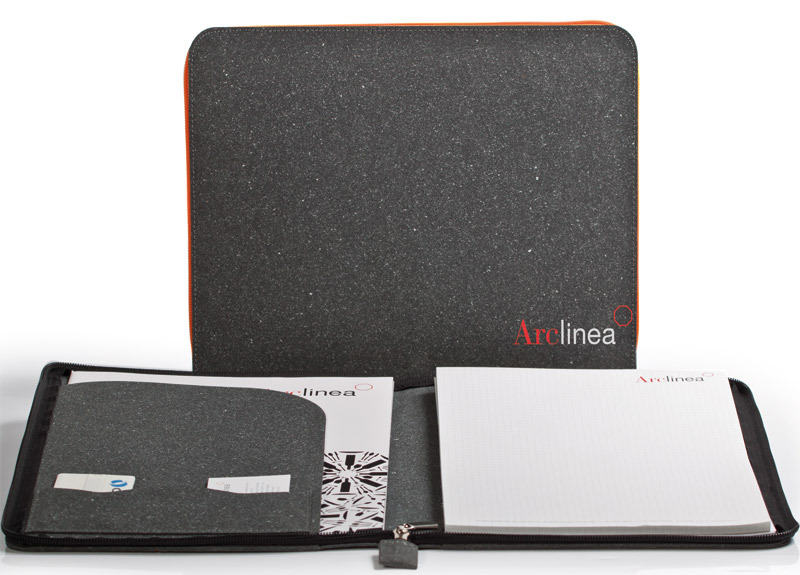 Gray Ricuoio® folder with rubber handle. 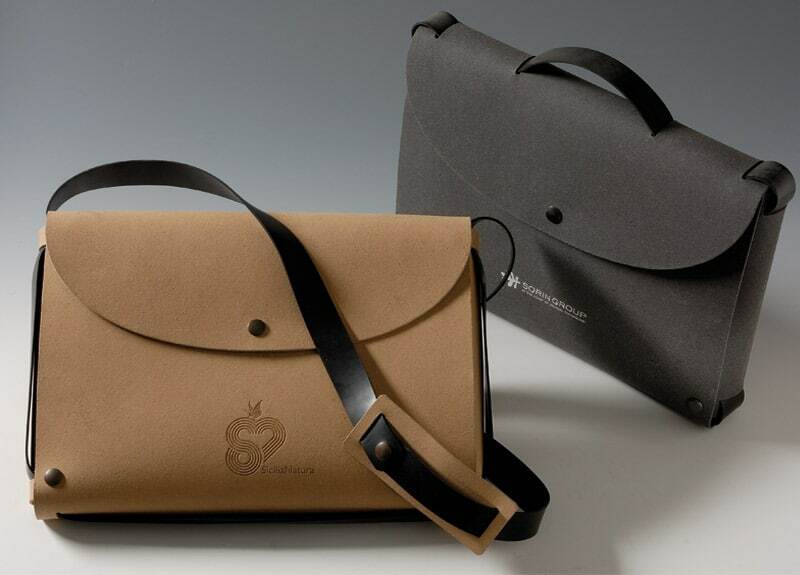 Gray Ricuoio® folder with cotton shoulder strap. 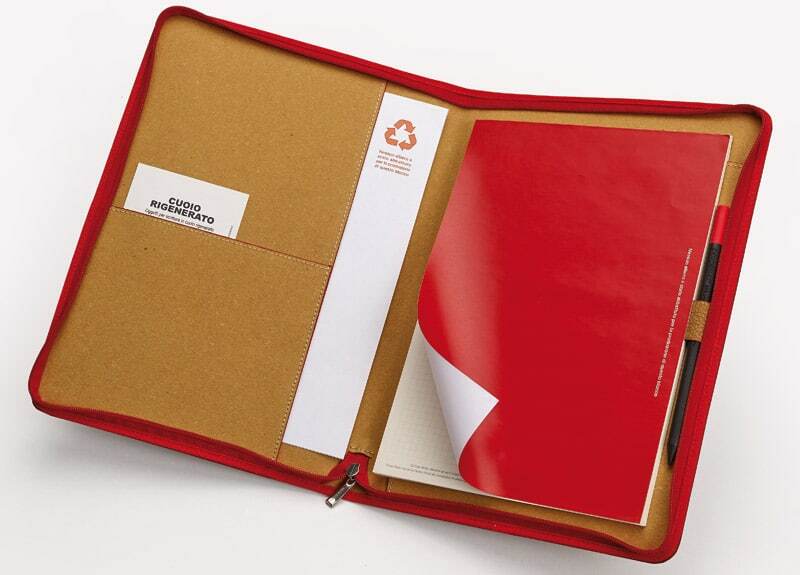 Havana brown Ricuoio® folder with cotton handle. 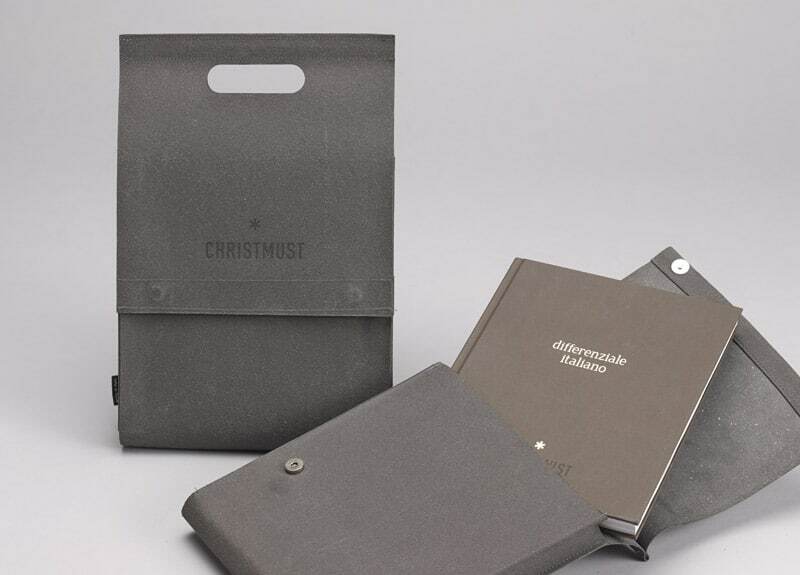 Made as packaging for the Christmust Differenziale Italiano edition. 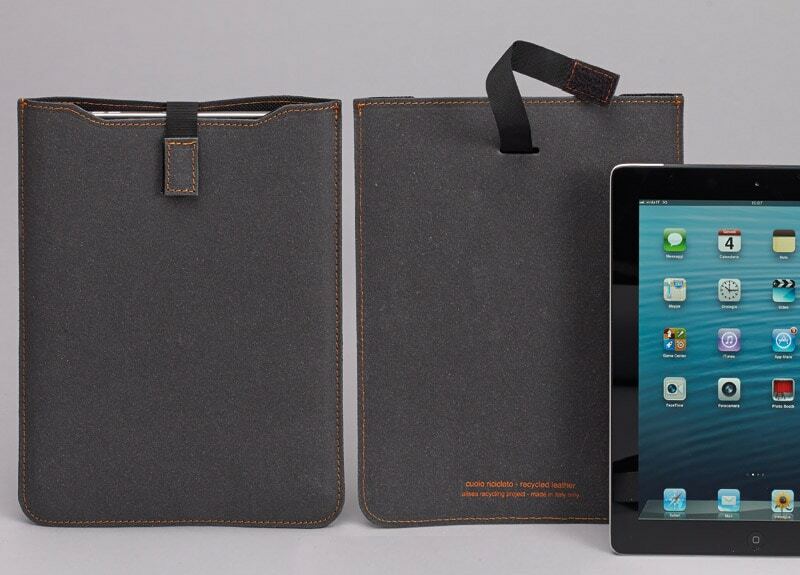 Gray Ricuoio® case designed to aid the removal of the iPad from the case by using a flat elastic fastener. Edge seams stitched using cotton thread. Customized silk screen printing. Ecological mission and Italian brand marked on the back. 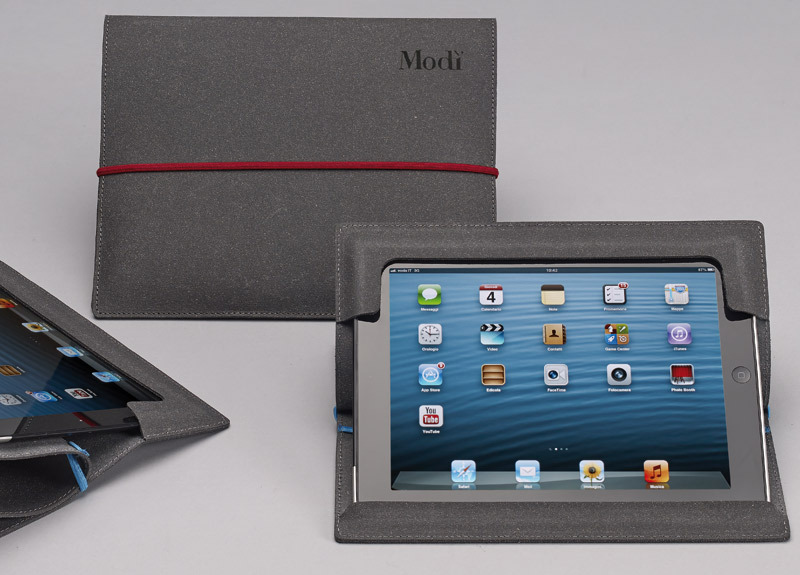 Gray Ricuoio® iPad case can be opened and closed with the elastic strap and it can be adjusted to allow the iPad to sit at an angle. 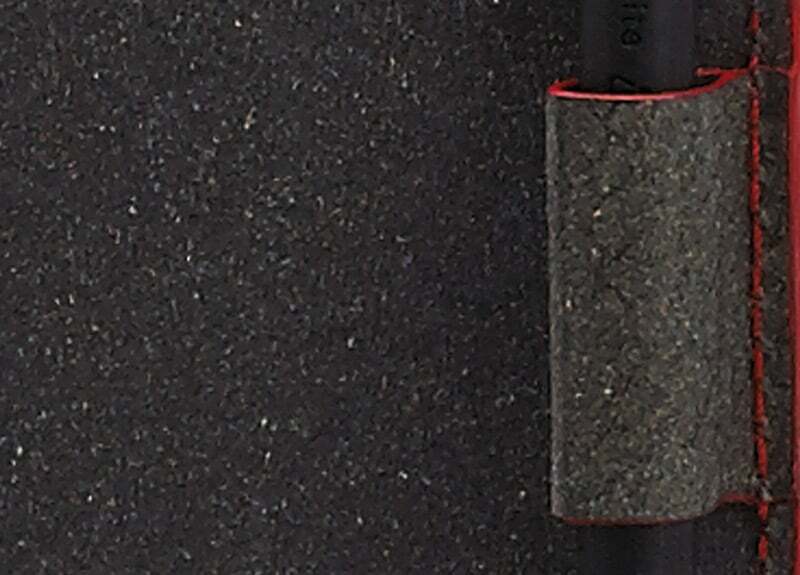 Edge seam sewn using Cañete cotton, inside lined with anti-shock “3D net” padding. Customization: Hot stamping, silk screen printing, digital printing. The surface of the Havana brown Ricuoio® coin tray is printed (embossed) with a texture that mimics the “grain” of buffalo hide. The edges are painted by hand with vegetable-based colors and the outer seams are made of cotton thread. Sizes 20×20 cm (7.87×7.87 in) and 30×30 cm (11.81×11.81 in). 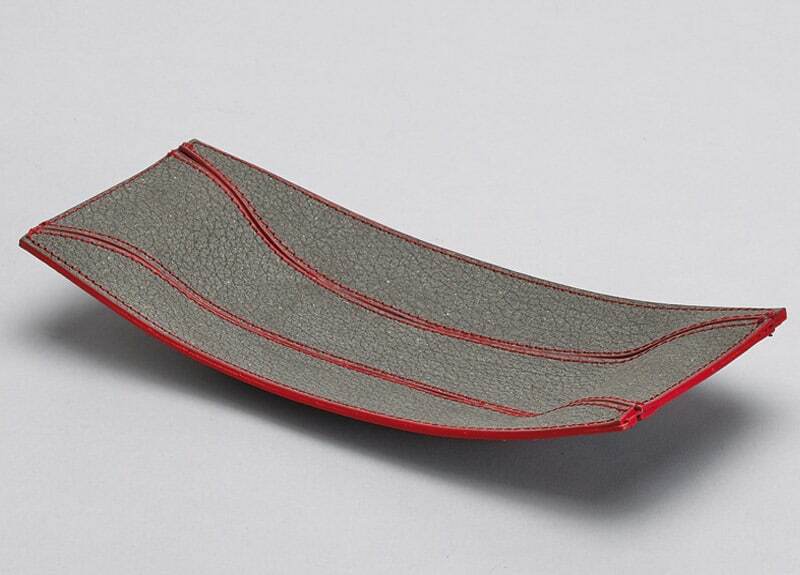 Gray Ricuoio® storage tray with colored seams and edges 25×11.5 cm (9.84×11.5 in). Gray and Havana brown Ricuoio® coin tray. Ricuoio® is made from the residues of leather processing with the added natural rubber. Complete with recycled paper sheets and a black pencil. 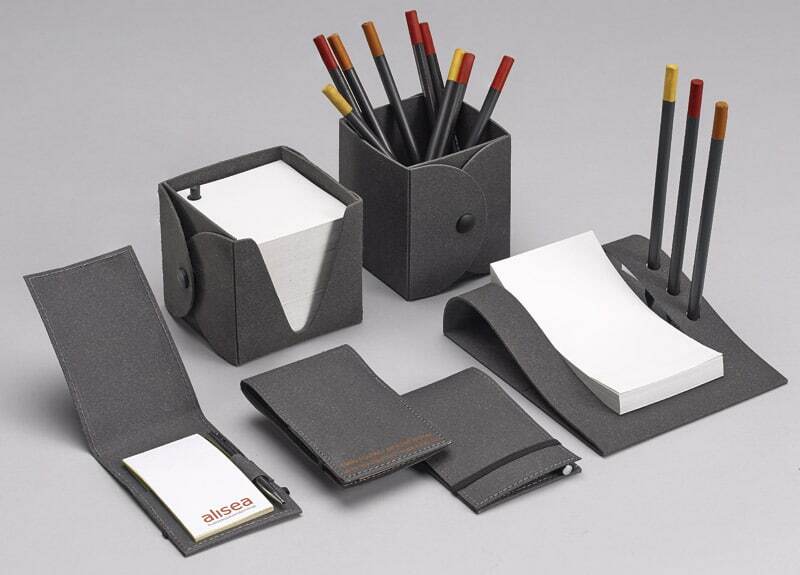 With pen holder for 3 pens together with rectangular note paper block made from recycled paper. 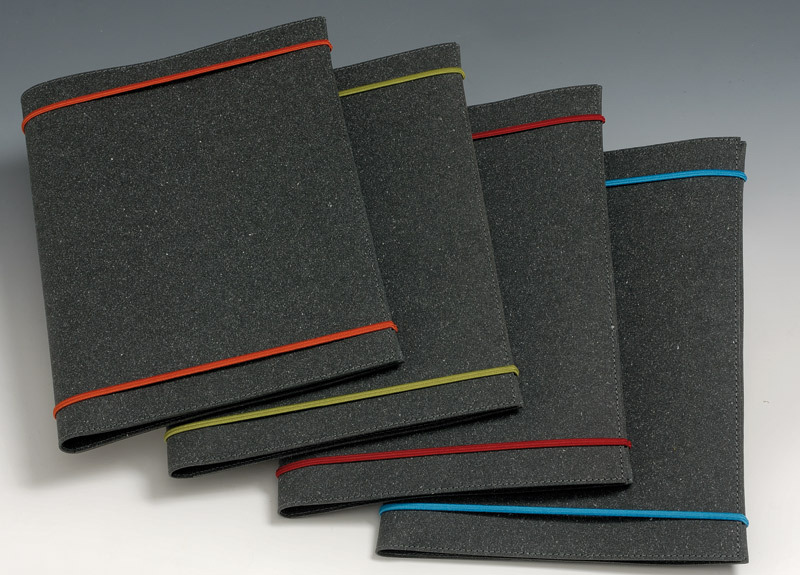 Pocket notepad with elastic fastener. 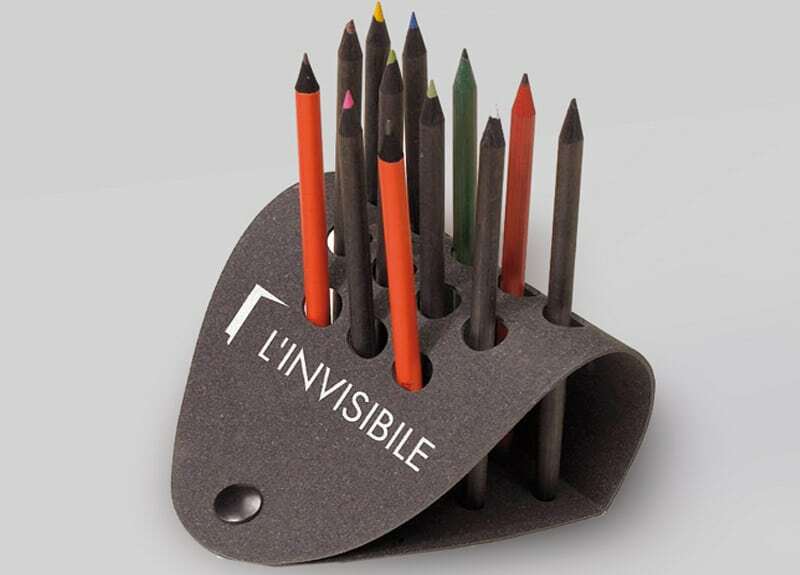 Container, pencil holder with button closure in gray and Havana brown Ricuoio®. Foglia, leaf-shaped pen holder with button closure and silver hot stamp design on gray Ricuoio®. Gray Ricuoio® and brisè ring. 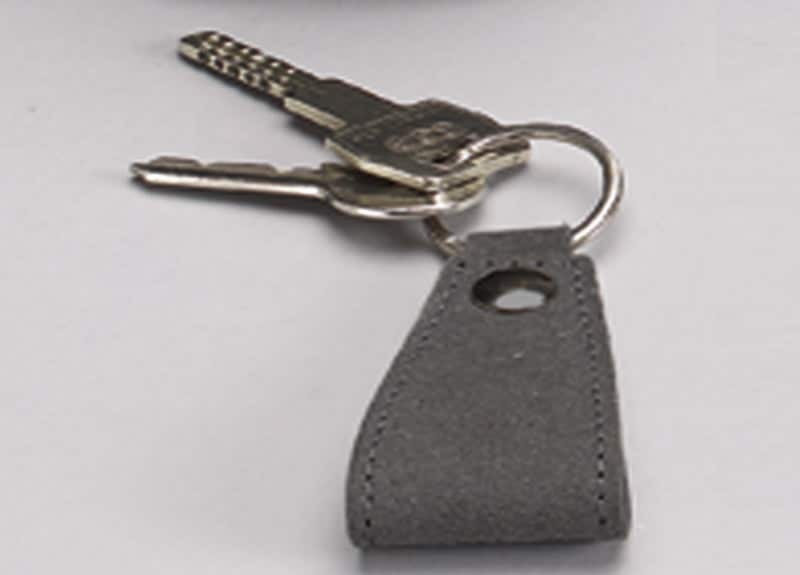 Gray Ricuoio® key ring with zip closure and brisè ring. 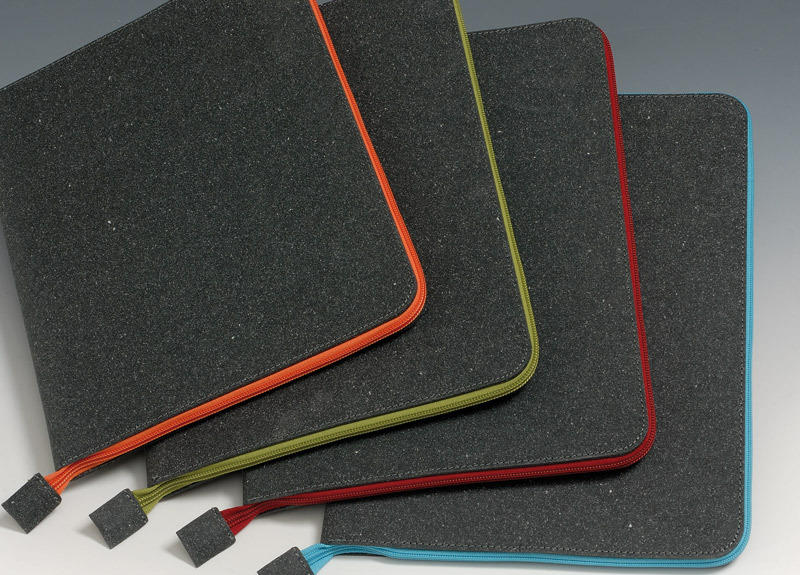 Gray Ricuoio® case with colored edges in natural colors. Gray Ricuoio® case, made using the customer’s design. 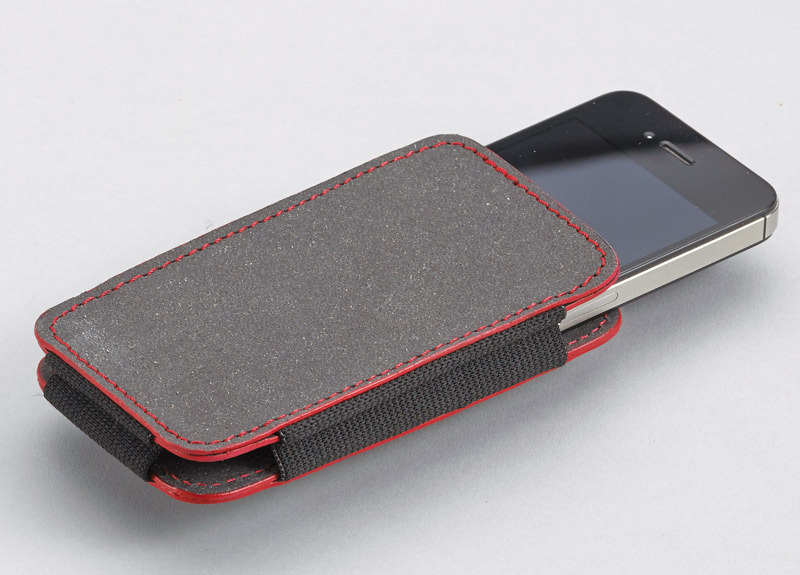 Gray Ricuoio® case with snap button closure.